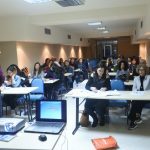 Learning basic Greek during mobility programmes is not only stimulating learning experiences, but it is also essential for the participants to easily adapt to the new cultural environment, giving a chance for form a solid group, making friends and feel spontaneous. The German ‘IdA – Integration through Exchange’ programme, entitled “CHANCE EUROPA”, promoted by “Kreisagentur für Beschäftigung Darmstadt-Dieburg”, having as an international partner the European Center inTraining fro Employment – ECTE, provides support for people with difficulties in entering or re-entering the labour market to enhance their professional competencies through a work stay abroad. Young people from Germany have the chance to get working experience in Rethymnon for two months, until the end of October 2016. The participants receive linguistic, technical, practical and intercultural preparation prior to departure. 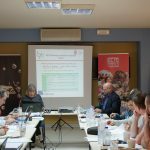 After completing the placement in Rethymnon, they will take part in a wrap-up and integration phase in their home region. This ensures that new competencies are recognised and that participants are supported adequately in taking new occupational or training pathways. The executing agencies use this debriefing phase to take preparations for job placements, training, (secondary) school or ex-post school-leaving qualification etc. This is realised in close consultation and cooperation with job centres and/or employment agencies (integration chain).